For other uses, see Lambeth (disambiguation). The origins of the name of Lambeth come from its first record in 1062 as Lambehitha, meaning 'landing place for lambs', and in 1255 as Lambeth. In the Domesday Book, Lambeth is called "Lanchei", likely in error. The name refers to a harbour where lambs were either shipped from or to. It is formed from the Old English 'lamb' and 'hythe'. 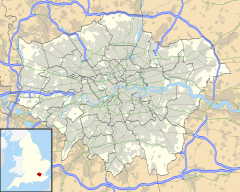 South Lambeth is recorded as Sutlamehethe in 1241 and North Lambeth is recorded in 1319 as North Lamhuth. The manor of Lambeth is recorded as being under ownership of the Archbishop of Canterbury from at least 1190. The Archbishops led the development of much of the manor, with Archbishop Hubert Walter creating the residence of Lambeth Palace in 1197. Lambeth and the palace were the site of two important 13th-century international treaties; the Treaty of Lambeth 1217 and the Treaty of Lambeth 1212. Edward, the Black Prince lived in Lambeth in the 14th century in an estate that incorporated the land not belonging to the Archbishops, which also included Kennington (the Black Prince road in Lambeth is named after him). As such, much of the freehold land of Lambeth to this day remains under Royal ownership as part of the estate of the Duchy of Cornwall. Lambeth was also the site of the principal medieval London residence of the Dukes of Norfolk, but by 1680 the large house had been sold and ended up as a pottery manufacturer, creating some of the first examples of English delftware in the country. The road names, Norfolk Place and Norfolk Row reflect the history and legacy of the house today. The area grew with an ever-increasing population at this time, many of whom were considerably poor. As a result, Lambeth opened a parish workhouse in 1726. In 1777 a parliamentary report recorded a parish workhouse in operation accommodating up to 270 inmates. On 18 December 1835 the Lambeth Poor Law Parish was formed, comprising the parish of St Mary, Lambeth, "including the district attached to the new churches of St John, Waterloo, Kennington, Brixton, Norwood". Its operation was overseen by an elected Board of twenty Guardians. Following in the tradition of earlier delftware manufacturers, the Royal Doulton Pottery company had their principle manufacturing site in Lambeth for several centuries. The Lambeth factory closed in 1956 and production was transferred to Staffordshire. However the Doulton offices, located on Black Prince Road still remain as they are a listed building, which includes the original decorative tiling. Between 1801 and 1831 the population of Lambeth trebled and in ten years alone between 1831 and 1841 it increased from 87,856 in to 105,883. The railway first came to Lambeth in the 1840s, as construction began which extended the London and South Western Railway from its original station at Nine Elms to the new terminus at London Waterloo via the newly constructed Nine Elms to Waterloo Viaduct. 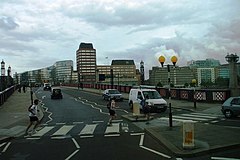 With the massive urban development of London in the 19th century and with the opening of the large Waterloo railway station in 1848 the locality around the station and Lower Marsh became known as Waterloo, becoming an area distinct from Lambeth itself. The Royal Pharmaceutical Society's headquarters were located in Lambeth High Street from 1976 until 2015. For a list of street name toponymys in the area, see Street names of Kennington and Lambeth. The current district of Lambeth was part of the large ancient parish of Lambeth St Mary in the Brixton hundred of Surrey. It was an elongated north-south parish with a two-mile River Thames frontage to the west. In the north it lay opposite the cities of London and Westminster and extended southwards to cover the contemporary districts of Brixton, West Dulwich and West Norwood, almost reaching Crystal Palace. Lambeth became part of the Metropolitan Police District in 1829. It continued as a single parish for Poor Law purposes after the Poor Law Amendment Act 1834 and a single parish governed by a vestry after the introduction of the Metropolitan Board of Works in 1855. In 1889 it became part of the county of London and the parish and vestry were reformed in 1900 to become the Metropolitan Borough of Lambeth, governed by Lambeth Borough Council. In the reform of local government in 1965, the Streatham and Clapham areas that had formed part of the Metropolitan Borough of Wandsworth were combined with Lambeth to form the responsible area of local government under the London Borough of Lambeth. The current mayor is Cllr Christopher Wellbelove as of May 2018. The council is run by a leader and cabinet, chaired by council leader Lib Peck. All cabinet members are from the Labour Party. The leader of the opposition is Green Party Co-leader Jonathan Bartley and the leader of the Conservative opposition is Timothy Briggs. The chief executive is Andrew Travers. In the 2016 EU referendum, Lambeth issued the highest "Remain" vote in the United Kingdom (besides Gibraltar) with almost 79% of residents advocating the United Kingdom staying in the European Union. At the 2015 General Election, all three Labour candidates were elected Kate Hoey for Vauxhall, Chuka Umunna for Streatham & Helen Hayes for Dulwich and West Norwood. The Conservative Party finished the runners up in all three seats. At the snap 2017 general election, Hoey, Umunna and Hayes were re-elected with increased majorities. The Liberal Democrat candidate George Turner finished the runner up in Vauxhall achieving a 5% swing in his favour, the only London Liberal Democrat candidate to do so against a sitting Labour MP. The Conservative candidates Rachel Wolf and Cllr Kim Caddy finished the runner up in Dulwich & West Norwood and Streatham respectively. At the 2018 Local Elections, Labour remained in control of the council with 57/63 seats, (down 2 seats from 2014). The Greens gained 4 seats and achieved a total 5/63 seats. The Conservatives were reduced down to a single seat, and the Liberal Democrats failed to gain any seats. In February 2018, Umunna defected to The Independent Group. 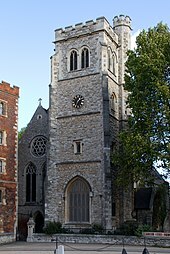 The church of St Mary-at-Lambeth is the oldest above ground structure in Lambeth, the oldest structure of any kind being the crypt of Lambeth Palace itself. The church has pre-Norman origins, being recorded as early as 1062 as a church built by Goda, sister of Edward the Confessor. It was rebuilt in flint and stone between the years 1374 and 1377. The tower is the only original part still to survive, as much of the church was reconstructed by 1852. The church was de-consecrated in 1972 and since 1977 it has been the home of the Garden Museum. Lambeth Palace is the home of the Archbishop of Canterbury and has been occupied as a residence by the Archbishops since the early 13th century. The oldest parts of the palace are Langton's Chapel and its crypt, both of which date back to the 13th century. Although they suffered greatly from damage in the Second World War, they have seen been extensively repaired and restored. Morton's Tower, the main entrance to the palace, was built in 1490. The Great Hall, rebuilt over different centuries but primarily following damage during the English Civil War, contains the vast collections of the Lambeth Palace Library. Later additions to the palace including the Blore Building, a newer private residence for the Archbishop, which was completed in 1833. The Albert Embankment, finished in 1869 and created by the engineer Sir Joseph Bazalgette under the Metropolitan Board of Works, forms the boundary of Lambeth. The embankment includes land reclaimed from the river and various small timber and boat-building yards, and was intended to protect low-lying areas of Lambeth from flooding while also providing a new highway to bypass local congested streets. Unlike the Thames Embankment on the opposite side of the river, the Albert Embankment does not incorporate major interceptor sewers. This allowed the southern section of the embankment (upstream from Lambeth Bridge) to include a pair of tunnels leading to a small slipway, named White Hart Draw Dock, whose origins can be traced back to the 14th century. Centuries later, Royal Doulton's pottery works used the docks to load clay and finished goods for transport to and from the Port of London. The refurbishment of White Hart Dock was carried out as part of a local art project in 2009, which included the addition of wooden sculptures and benches to the 1868 dock boundary wall. Located on the Albert Embankment is the purpose-built headquarters of the International Maritime Organization (IMO). The IMO is a specialised agency of the United Nations responsible for regulating shipping. The building was officially opened by Queen Elizabeth II on 17 May 1983. The architects of the building were Douglass Marriott, Worby & Robinson. The front of the building is dominated by a seven-metre high, ten-tonne bronze sculpture of the bow of a ship, with a lone seafarer maintaining a look-out from Lambeth to the Thames. From 1937 until 2007 the headquarters of the London Fire Brigade were in Lambeth, on Albert Embankment. The headquarters building, constructed in an art deco style, was designed by architects of the London City Council and opened in 1937. Occupying a prominent position on the Thames it is, however, still an operating fire station, although future plans have been submitted which may see redevelopment of the listed building. The Lambeth Mission is a church of the united Methodist Anglican denomination, located on Lambeth Road. The original church was founded in 1739 but was entirely destroyed by a bomb in the Second World War. A new church for the mission was constructed in 1950 and continues to function as an active church today. The Beaconsfield gallery is a public contemporary art gallery in Lambeth, which was established in 1995 and specialises in temporary exhibitions and art classes. Morley College is an adult education college, founded in the 1880s, that occupies sites on either side of the boundary between the London boroughs of Southwark and Lambeth. In William Blake's epic Milton: A Poem in Two Books, the poet John Milton leaves Heaven and travels to Lambeth, in the form of a falling comet, and enters Blake's foot. This allows Blake to treat the ordinary world as perceived by the five senses as a sandal formed of "precious stones and gold" that he can now wear. Blake ties the sandal and, guided by Los, walks with it into the City of Art, inspired by the spirit of poetic creativity. The poem was written between 1804 and 1810. Liza of Lambeth, the first novel by W. Somerset Maugham, is about the life and loves of a young factory worker living in Lambeth near Westminster Bridge Road. Thyrza, a novel by George Gissing first published in 1887, is set in late Victorian Lambeth, particularly Newport Street, Lambeth Walk and Walnut Tree Walk. The novel was intended by Gissing to "contain the very spirit of London working-class life". The story tells of Walter Egremont, an Oxford-trained idealist who gives lectures on literature to workers, some of them from his father's Lambeth factory. Lambeth has several areas of public parks and gardens. This includes Old Paradise Gardens, which is a park occupying former burial ground on Lambeth High Street and old Paradise Street. A watch-house for holding the 'drunk and disorderely' existed on the site, from 1825 until 1930 and is today marked by a memorial stone. Lambeth Walk Open Space is a small public park to the east of Lambeth on Fitzalan walk and includes several open spaces and play areas. Pedlars' Park is another small public park in Lambeth, which was created in 1968 on the site of the former St. Saviour's Salamanca Street School. The Archbishop's Park is open to the public and borders the edge of Lambeth Palace and the neighbouring area of Waterloo and the hospital of St Thomas. The nearest London Underground stations are Waterloo, Southwark, Oval, Brixton and Lambeth North. London Waterloo is also a National Rail station as is Waterloo East which is located in-between both Waterloo and Southwark stations. Vauxhall station is also nearby in Vauxhall, situated more towards the South Lambeth area near Kennington. The South Western Main Line runs through Lambeth on the Nine Elms to Waterloo Viaduct. The principal road through the area is Lambeth Road (the A3203). Lambeth Walk adjoins Lambeth Road. The current Lambeth Bridge opened on 19 July 1932. It replaced an earlier suspension bridge which itself was built between 1862 and 1928, but was eventually closed and demolished following the 1928 Thames flood. ^ Wheatley, Henry Benjamin; Cunningham, Peter (2011) [First published in 1891]. London Past and Present: Its History, Associations, and Traditions. Cambridge University Press. p. 355. ^ a b c Mills, D. (2000). Oxford Dictionary of London Place Names. Oxford. ^ a b c "London Borough of Lambeth". Ideal Homes: A History of South-East London Suburbs. Retrieved 25 November 2016. ^ a b "Lambeth". Vauxhall History Online Archive. Retrieved 26 November 2016. ^ "Royal Southwark and Lambeth". Vauxhall History Online Archive. Retrieved 26 November 2016. ^ a b c d e f g "Lambeth Pharmacy Walk" (PDF). Royal Pharmaceutical Society. Retrieved 30 November 2016. ^ a b "Lambeth: The parish". British History. Retrieved 30 November 2016. ^ "Lambeth (Parish of St Mary), Surrey, London". workhouses.org. Retrieved 25 November 2016. ^ a b c "Memorial – White Hart Dock". London Remembers. Retrieved 25 November 2016. ^ a b "Streets of London: Lambeth Walk". BBC News. Retrieved 26 November 2016. ^ "Lambeth Baths". Vauxhall History Online Archives. Retrieved 26 November 2016. ^ "Pharmacy History and Lambeth". Royal Pharmaceutical Society. Retrieved 25 November 2016. ^ a b "St Mary – A history". The Garden Museum. Retrieved 25 November 2016. ^ a b c d e "The History of Lambeth Palace". The Archibishop of Canterbury. Retrieved 25 November 2016. ^ "White Hart Dock". Plaques of London. Retrieved 25 November 2016. ^ a b "IMO History: 30 years" (PDF). International Maritime Organization. Retrieved 25 November 2016. ^ "Introduction to IMO". International Maritime Organization. Retrieved 25 November 2016. ^ a b "IMO Building History". Manchester History. Retrieved 25 November 2016. ^ a b "Fire Brigade HQ History". Manchester History. Retrieved 25 November 2016. ^ "Developer appointed for Albert Embankment Site". London Fire Brigade. Retrieved 25 November 2016. ^ a b "Lambeth Mission & St Mary's". North Lambeth Parish. Retrieved 25 November 2016. ^ "Main Site". Beaconsfield Gallery. Retrieved 30 November 2016. ^ "About". Morley College. Retrieved 30 November 2016. ^ "Liza of Lambeth". Vauxhall History Online Archive. Retrieved 30 November 2016. ^ "Lambeth Parish Watch House". Vauxhall History Online Archive. Retrieved 26 November 2016. ^ "Lambeth Walk Open Space". Open Play. Retrieved 30 November 2016. ^ "Pedlars' Park". London Park Life. Retrieved 30 November 2016. ^ "Lambeth Bridge and its predeceasor". British History. Retrieved 30 November 2016.